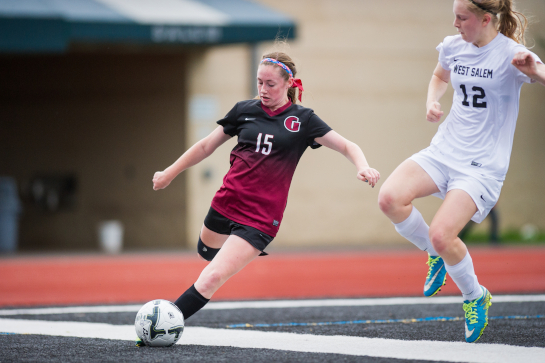 Success in the OSAA State Soccer Championship playoffs has been elusive for the Glencoe Girls soccer program since its origin in 1980. 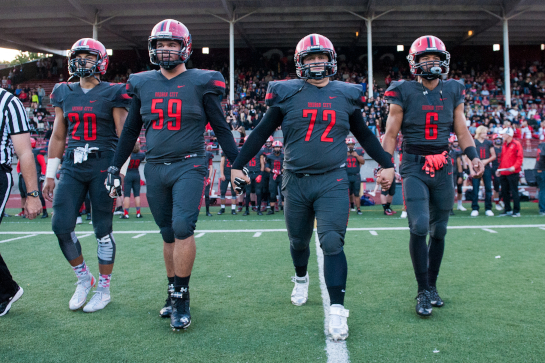 With barely a handful of playoff wins throughout the years, travelling to Salem to take on the number 11 seed West Salem Titans in the first round of the OSAA 6A playoffs as a number 22 seed seamed to be a daunting task. 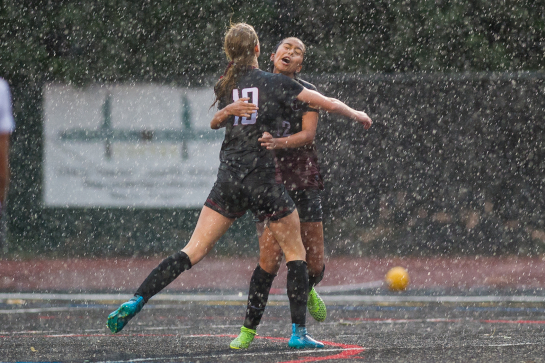 However, behind solid net minding from the Tide's second team all league Junior goalkeeper Caitlin Kastelic and two goals from Freshman Celeste Molina Sanchez, Glencoe fought through physical play in midfield and a torrential downpour in the second half to defeat West Salem 2-1. 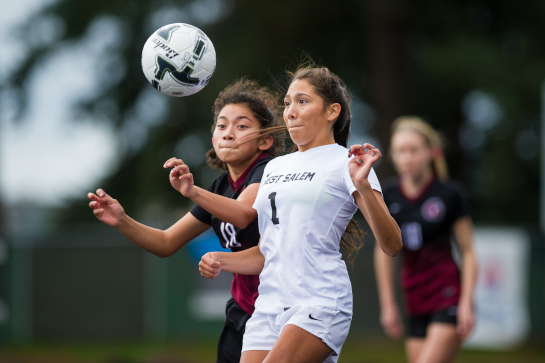 West Salem midfielder Liz Mendez (1) focuses on the ball to bring it under control under pressure from Glencoe midfielder Erika Ganzales Moreno (18) in the first half. 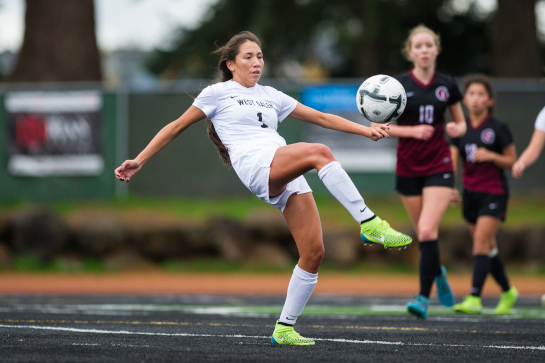 West Salem midfielder Liz Mendez (1) volleys the ball in the first half. 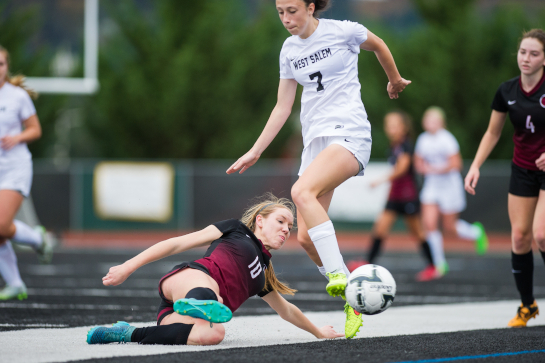 Glencoe midfielder Olivia Dendinger (10) dispossesses West Salem midfielder Paula-Marie Labate (7) with a sliding tackle in midfield during the first half. 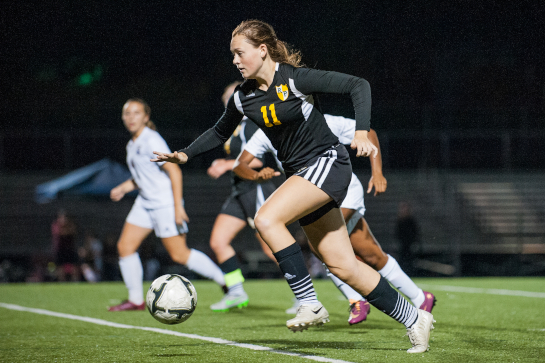 West Salem midfielder Liz Mendez (1) plays the ball forward during the first half. 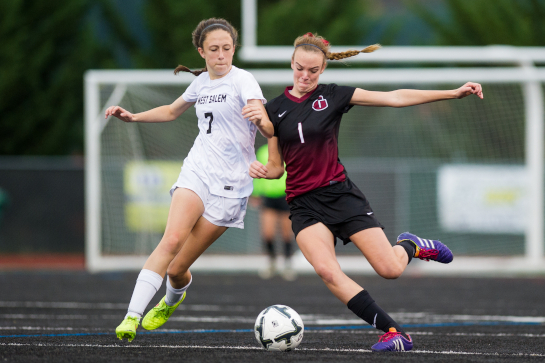 Glencoe midfielder Taylor Coulson (15) plays the ball out of the defensive third under pressure from West Salem defender Raine Loewen-Thomas (12) in the first half. 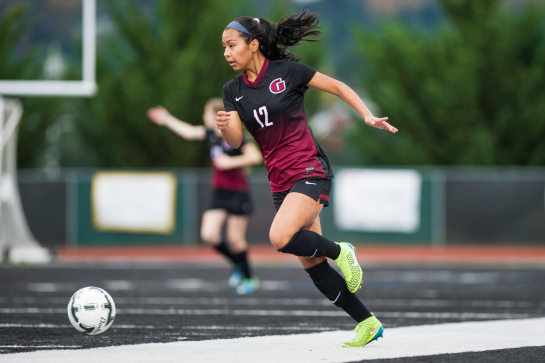 Glencoe midfielder Celeste Molina Sanchez (17) dribbles the ball during a second half attack. 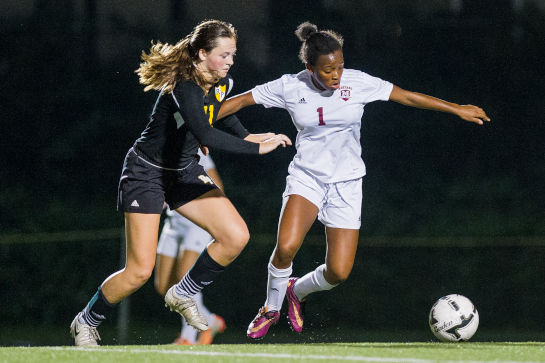 The Crimson Tide freshman scored a brace giving Glencoe its 2-1 playoff victory over the Titans. 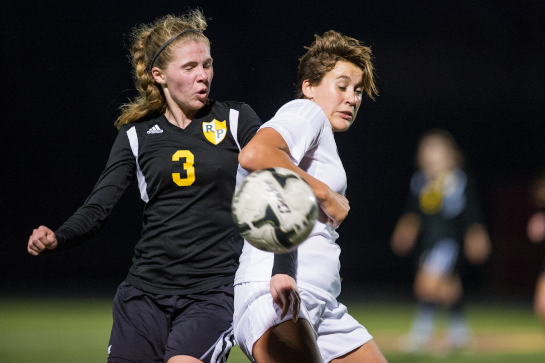 West Salem midfielder Paula-Marie Labate (7) and Glencoe defender Peyton Bell (1) battle for possession in the second half. 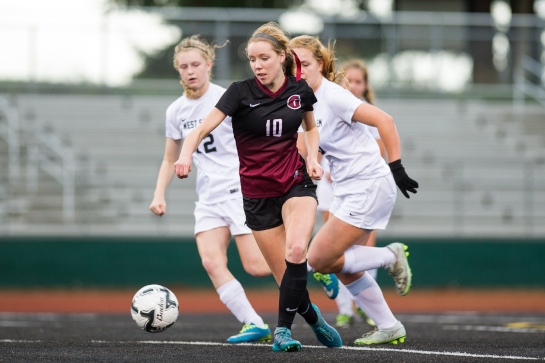 Glencoe midfielder Olivia Dendinger (10) dribbles the ball into the attacking third chased by West Salem defender Raine Loewen-Thomas (12) and Loryn Silbernagel (16) in the second half. 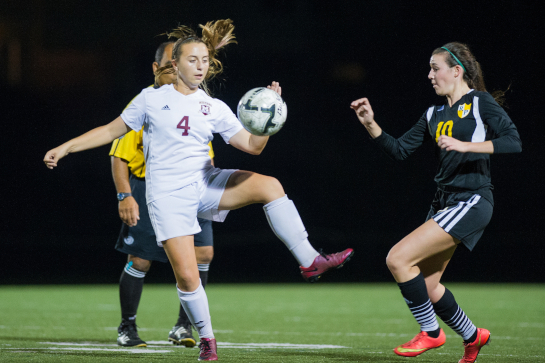 Glencoe midfielder Olivia Dendinger (10) dribbles the ball into the attacking third in the second half. Glencoe midfielder Olivia Dendinger (10) embraces midfielder Celeste Molina Sanchez (17) after Molina Sanchez scored her second goal of the match with 2:25 remaining in the match to put the Tide up 2-0. 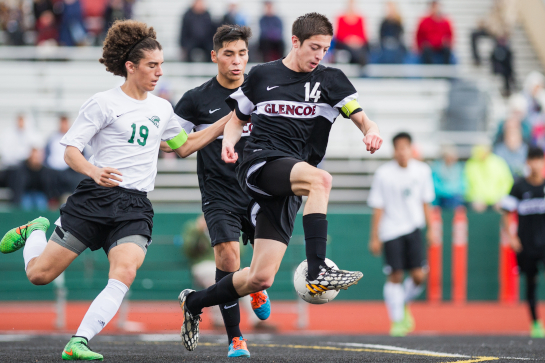 The Glencoe Tide soccer team lost 2-1 in extra time to West Salem in the OSAA 6A State Soccer Playoffs on the Titans' black turf. 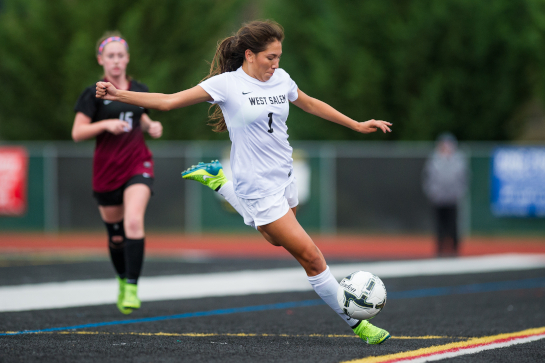 The Tide took control of the match early in the first half and narrowly chances very early in the match that would have set West Salem back on their heals. 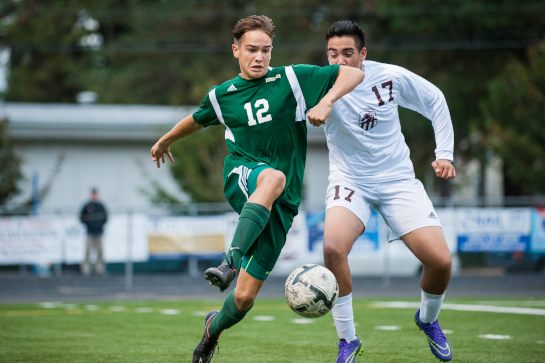 With most of the first half being played between the penalty boxes, it was the Tide that got the first lead in the match with 10:01 to play when a free kick at mid-field taken by Glencoe defender Jose Sanchez deflects off West Salem midfielder Joshua Bailey for an own goal. 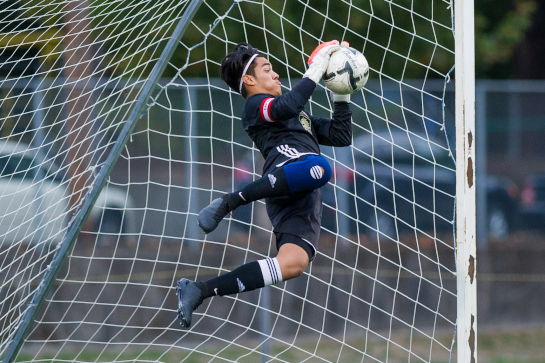 Midway through the second half Glencoe goalkeeper Toby Hodges was called for a foul on West Salem forward Cole Caldwell allowing the Titans to even the match 1-1 off the resulting penalty kick by Stuart Aeschliman. 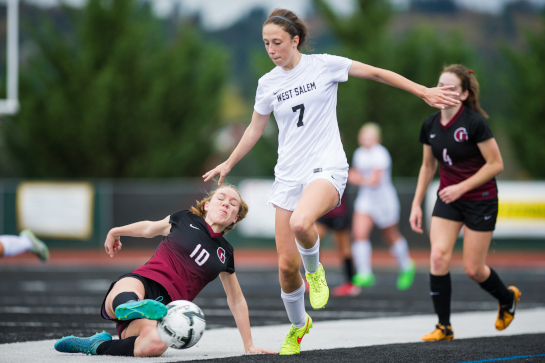 With regular time ending in a tie, West Salem came out in the first overtime period with a goal in the first minute off a header by Tyler Ballenger. 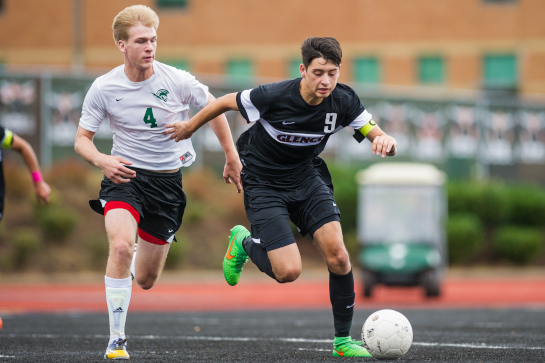 Glencoe struggled to muster a counter to the go-ahead goal and for a second year in a row stepped out of the playoffs with disappointment in the first round. 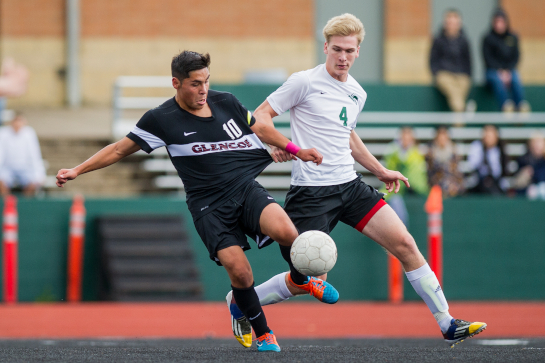 Glencoe forward Noah Spelman (left) dribbles past stumbling West Salem midfielder Eric Elizarraga Oregel (right) early in the first half. 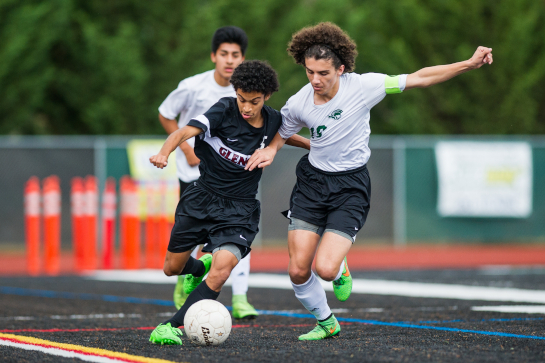 Glencoe midfielder Eddie Sauceda (left) dribbles down the right wing under pressure from West Salem midfielder Gabriel Linares (right) in the first half. 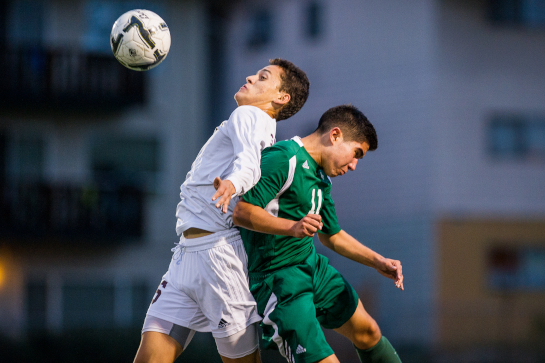 Glencoe midfielder Oscar Lara (10) controls the ball while having his shirt pulled by West Salem midfielder Joshua Bailey (4) in the first half. 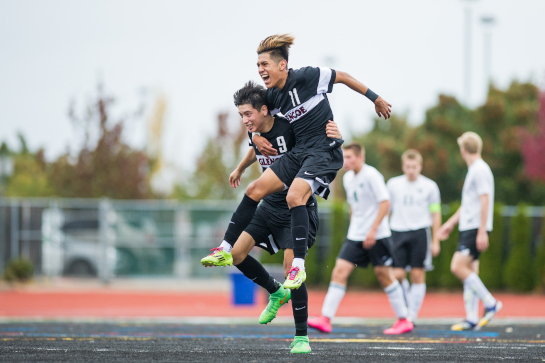 Glencoe forwards Javier Cazarez (9) and Jonathan Medal (11) celebrate the first goal of the match scored off an own goal by West Salem midfielder Joshua Bailey from a free kick by Glencoe defender Jose Sanchez with 10:01 remaining in the first half. Glencoe defender Jose Sanchez (hidden) is mobbed by his teammates after his free kick from mid-field results in an own goal by West Salem Joshua Bailey giving the Tide a 1-0 lead with 10.01 remaining in the first half. 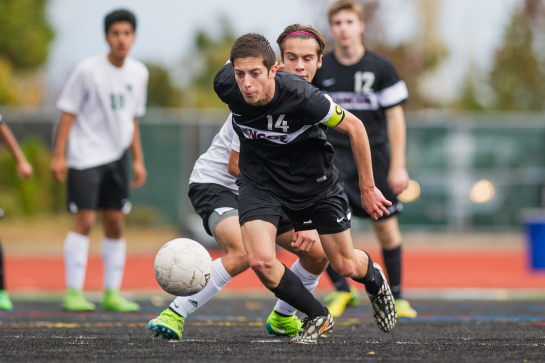 Glencoe midfielder Vladimir Romano (14) dribbles the ball under pressure from West Salem midfielder Gabriel Linares (19) late in the first half. 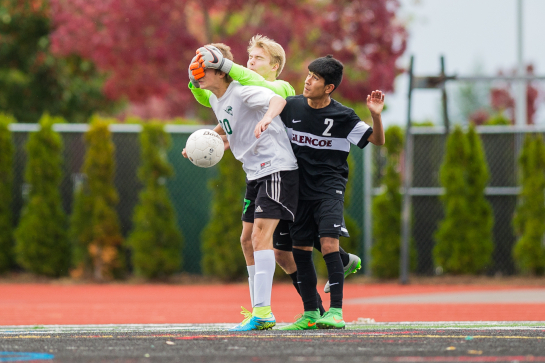 Glencoe goalkeeper Toby Hodges (center) is called for a foul on West Salem forward Cole Caldwell (left) leading to a penalty kick converted by midfielder Stuart Aeschliman with 20:48 in the second half to even the match 1-1. 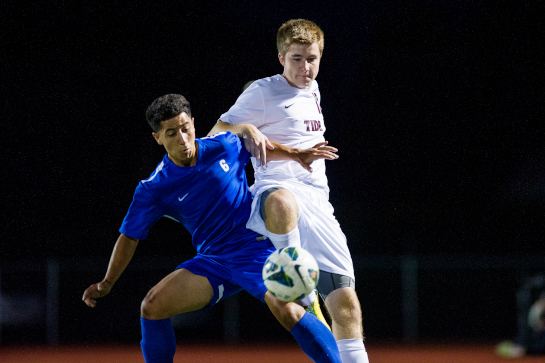 Also defending Caldwell is Glencoe defender Osveli Echevarria Acosta (2). 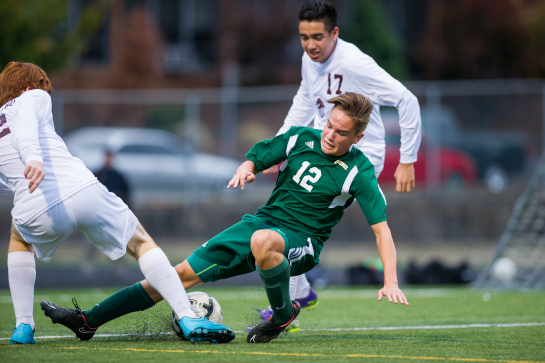 Glencoe defender Ethan VanderZanden (12) dribbles the ball past West Salem midfielder Stuart Aeschliman (9) in the second half. 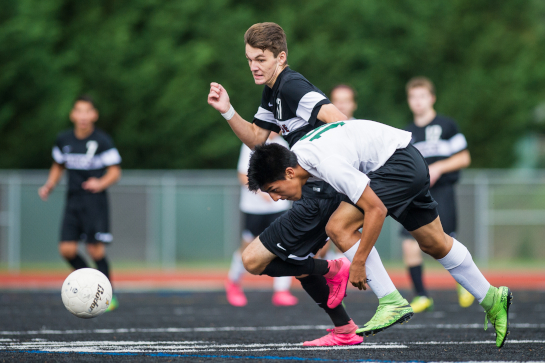 Glencoe forward Javier Cazarez (9) dribble the ball in midfield pursued by West Salem midfielder Joshua Bailey (4) in the second half. 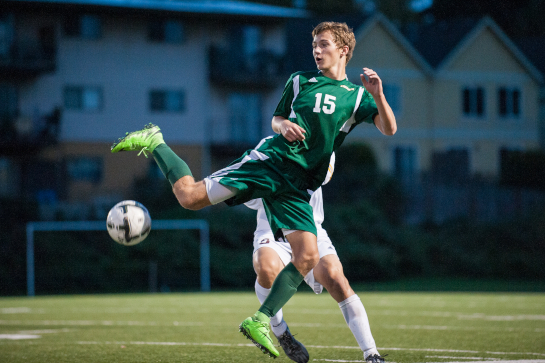 encoe midfielder Vladimir Romano (14) breaks free on the dribble from West Salem midfielder Stuart Aeschliman (behind) in second overtime period. 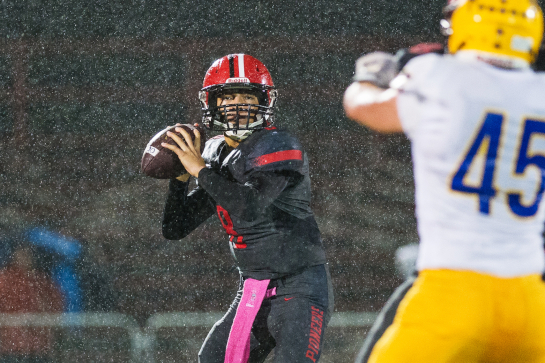 The rain never let up at Pioneer Stadium in Oregon City and neither did the flow of touchdowns against Barlow by Oregon City High School in a lopsided 65-7 Mt. 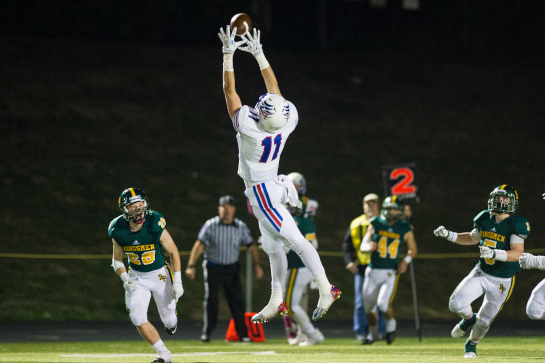 Hood Conference win for the Pioneers over the Bruins. 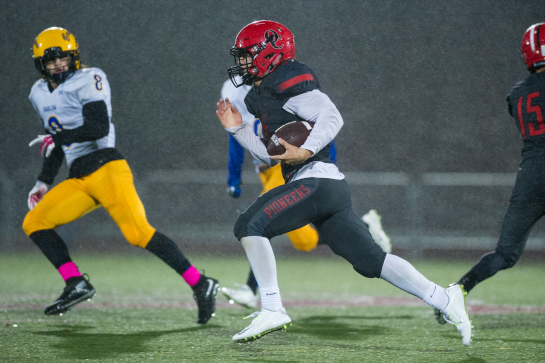 Under driving rain, the Pioneers wracked up a total of 584 yards which included big plays for touchdowns from Trevon Bradford (64 and 40 yards), Dequahn Dennis-Lee (88 yards), Sam Maughan (45 yards) and Riley Rexine (56 and 31 yards). 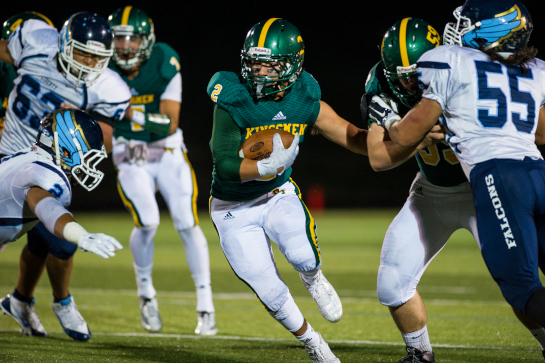 Running backs Danny Tkach and Conner Mitchell added a touchdown each to cap out the scoring. 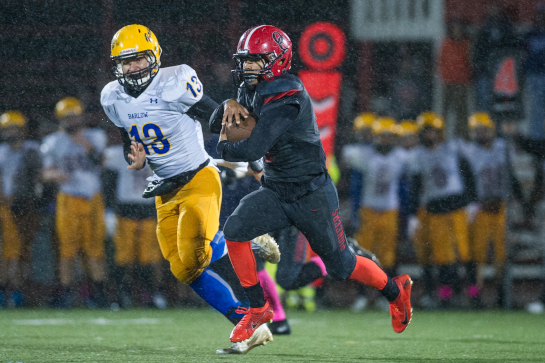 With the scoreboard reading 52-7 at halftime, the Bruins were aided by a running clock to bring a miserable game to an end on a night of miserable weather. 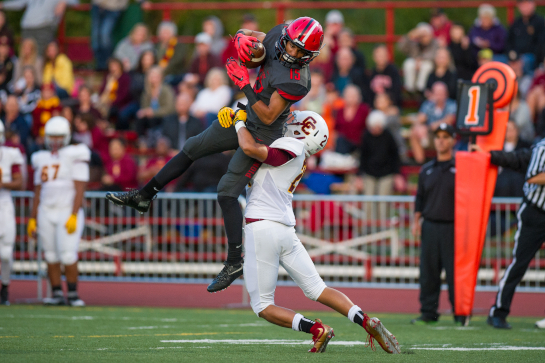 Oregon City quarterback Dequahn Dennis-Lee throws to wide receiver Teron Bradford in the final minute of the first quarter. 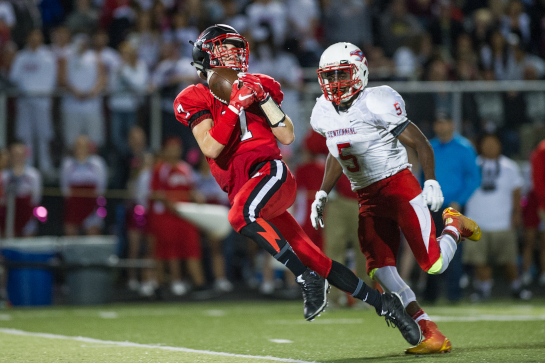 Oregon City wide receiver Connor Mitchell (5) returns a Barlow punt 90 yards for a touchdown with 8:00 remaining in the second quarter. 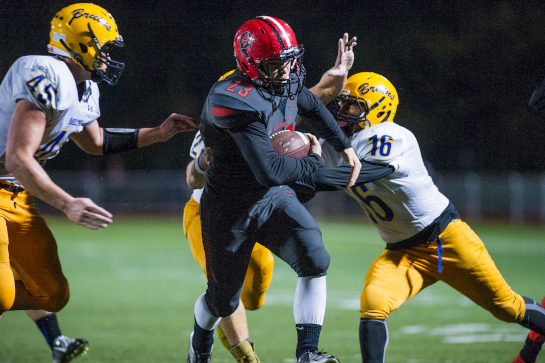 Oregon City running back Connor Mitchell (5) runs the ball 70 yards down to the Barlow two yardline to set up his touchdown run on the following play with fifteen seconds remaining in the second quarter. 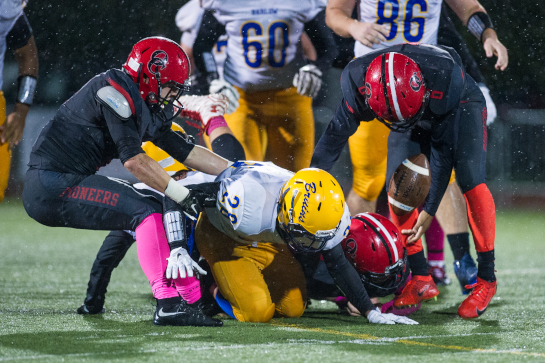 Oregon City defensive backs Tyler Dye (left) and Trevon Bradford (right) force a third quarter fumble by Barlow running back Jobadiah Malary (28) which is recovered by the Pioneers defensive end Brandon Dillon (36 not in picture). 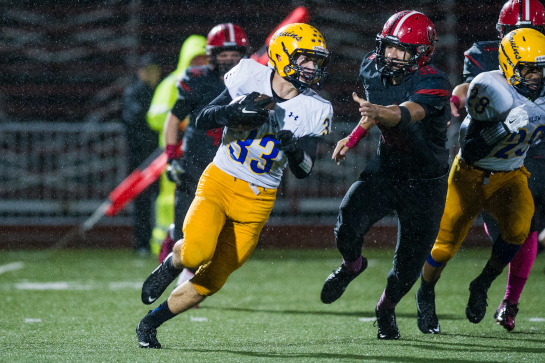 Barlow running back Wyatt Radke (33) pursued by Oregon City defensive end Brandon Dillon (36) on a kickoff return during the second quarter. 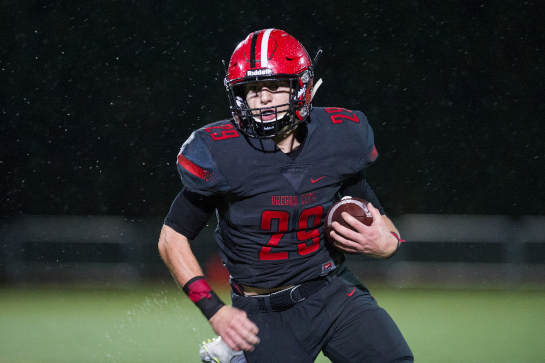 Oregon City running back Ethan Kassebaum (29) runs for a thirteen yard gain in the third quarter. 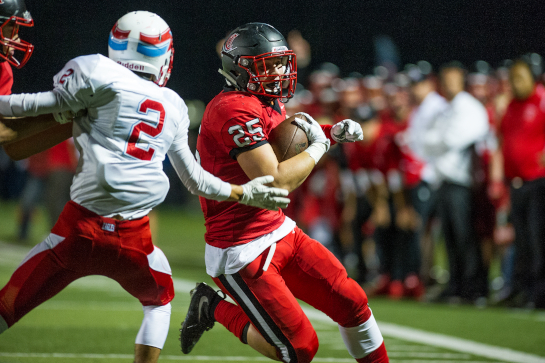 Oregon City running back Danny Tkach (23) runs for a twelve yard gain to the Barlow four yard line to set up a touchdown pass to Sam Maughan on the following play with 7:31 remaining in the third quarter. 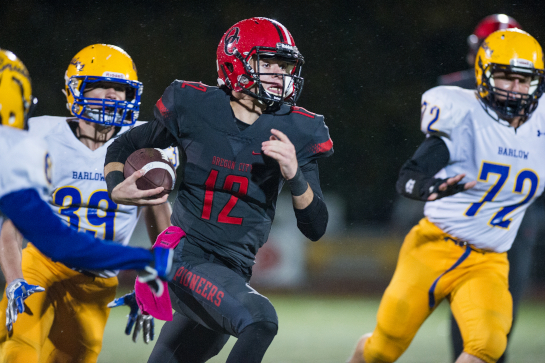 Oregon City quarterback Riley Rexine (12) runs for a 56 yard touchdown with 7:15 remaining in the fourth quarter. With 2:47 left on the clock in the fourth quarter the La Salle Falcons pulled ahead of the Rex Putnam Kingsmen off a two yard touchdown off a pass reception by Jalontae Walker from quarterback Nick McKoy for a 19-16 lead. All momentum was going the Falcons' way after La Salle broke a second half stalemate late in the game and pinning the Kingsmen on their own 25 yard line off the following kickoff. Putnam quarterback Jake Hamilton quickly swung the momentum in Putnam's favor with a 40 yard pass completion to Kane Stephens to advance the ball the the La Salle 35 yard line. On the very next play Jesse Countryman broke free found an opening on the right side of the line and sailed to the endzone to cap off a 75 yard drive in two plays in only 36 seconds. Tommy Ciobanasiu kicked the extra point to cap off the score at 23-19 for the Kingsmen. 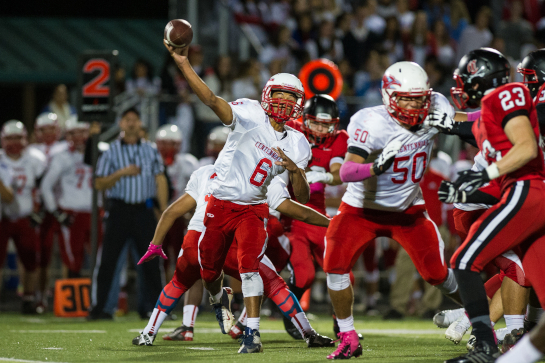 The Putnam defense forced a turnover on downs to sure the victory following the kickoff. 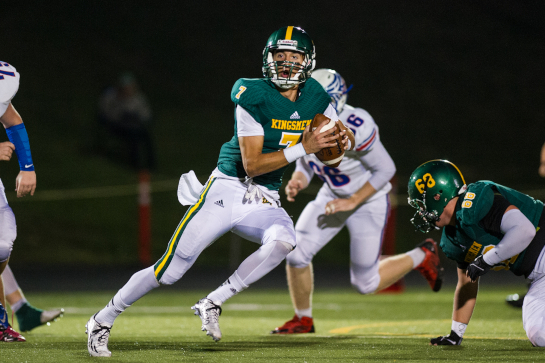 Rex Putnam quarterback Jake Hamilton (7) scrambles out of the pocket for a four yard gain during a second quarter drive. 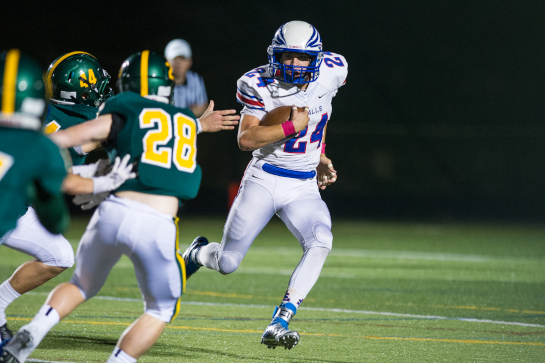 Rex Putnam running back Jesse Countryman (2) runs for a first down during a third quarter drive. 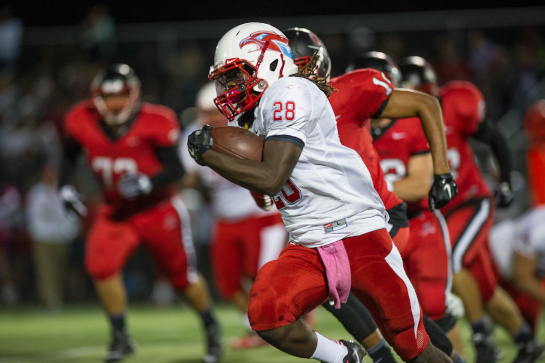 La Salle running back Quentin Pearson (24) runs the ball during a first quarter drive. 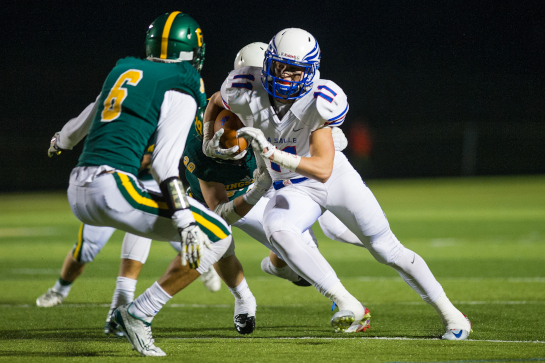 La Salle wide receiver Parker Cardwell (11) runs for a ten yard gain before being tackled by Rex Putnam defensive back Joseph Jesse (6) and Brice McDonald (behind) during the Falcons late fourth quarter scoring drive. La Salle wide receiver Parker Cardwell (11) pulls down a pass reception for a first down on second and twenty-two from their own twelve yard line with 9:07 to go in the fourth quarter. The play generated the Falcons 88 yard scoring drive with Jalontae Walker running for a two yard touchdown with 2:47 left in the fourth quarter to give La Salle a 19-16 lead. Rex Putnam wide receiver Kane Stephens (24) pulls down a 40 yard pass reception to move the ball from the Kingsmen 25 yard line to the La Salle 25 yard line. Jesse Countryman ran for a 25 yard touchdown on the following play to break the backs of the Falcons after the Kingsmen score 36 seconds after La Salle took a 19-16 lead with 2:47 left in the fourth quarter. 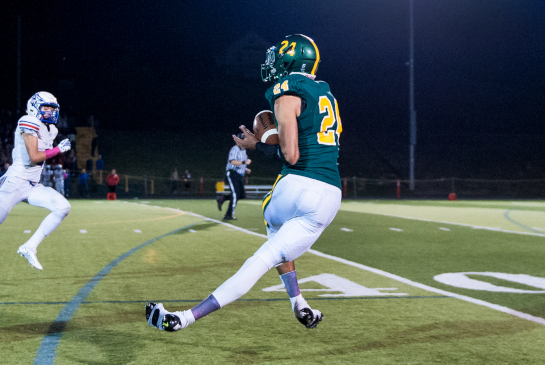 Following the La Salle kick-off Putnam drove 75 yards in two plays with a 40 yard pass reception to Stephens and Countryman’s 25 yard run to the endzone. Kicker Tommy Ciobanasiu scored the extra point to cap off the score at 23-19 for the Kingsmen. 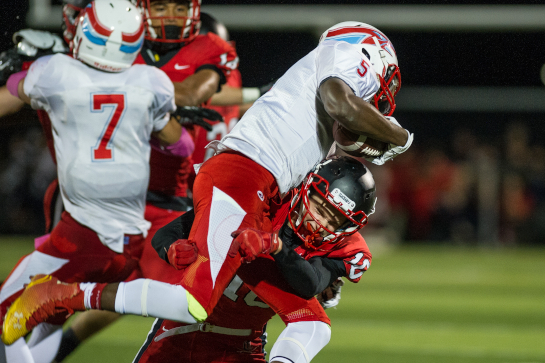 Rex Putnam running back Jesse Countryman (2) breaks free from La Salle defensive men Cayden Martinez (2) and Jhevon Lancaster (5) on his way for a 25 yard touchdown with 2:11 left in the fourth quarter to give Putnam the final lead of the game. Countrymans touchdown broke the backs of the Falcons after the Kingsmen score 36 seconds after La Salle took a 19-16 lead with 2:47 left in the fourth quarter. 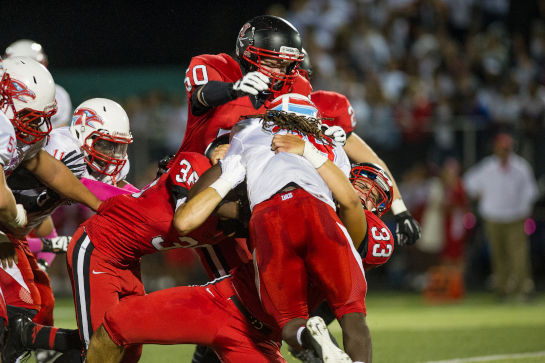 Following the La Salle kick-off Putnam drove 75 yards in two plays with a 40 yard pass reception to Kane Stephens and Countrymans 25 yard run to the endzone. Kicker Tommy Ciobanasiu scored the extra point to cap off the score at 23-19 for the Kingsmen. 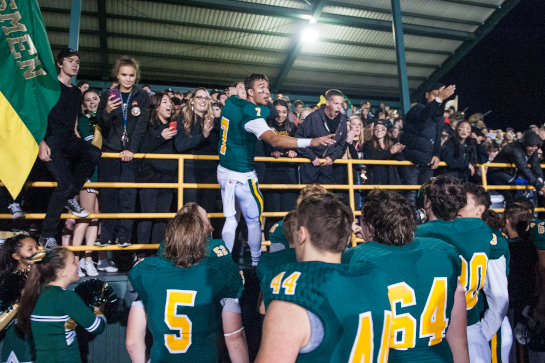 Rex Putnam quarterback Jake Hamilton leads the student section in signing the school fight song after an emotional victory 23-19 victory over local rival La Salle in the final minutes of the fourth quarter. In early October the Portland Trailblazers hold a party at the Moda Center to celebrate the opening of the new NBA season. 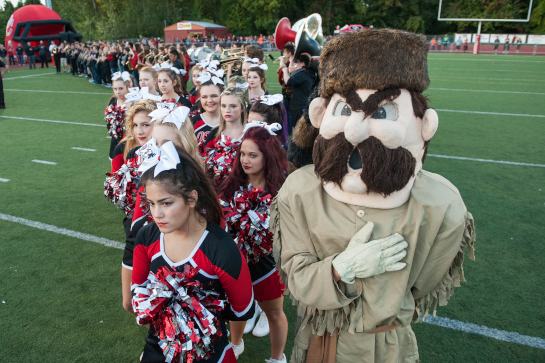 Their annual get-together with their loyal Blazermaniacs is call Fan Fest. 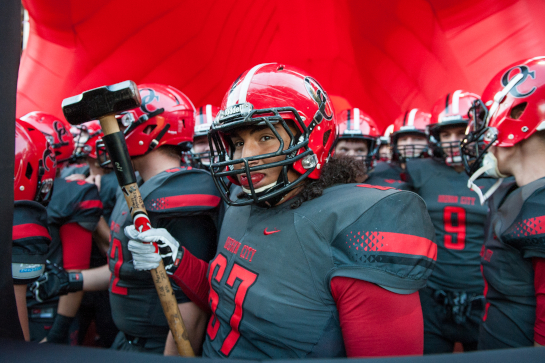 The event is free to all and when the doors open at 6pm many Blazer players are on hand welcoming the 14,000 fans as they enter the Moda Center. Blazer players also participated in an open Q&A with fans on the main concourse. The evening is very loose, festive and interactive. The main event of the evening is a scrimmage between the black team led by Damian Lillard against the white team featuring Meyers Leonard and CJ McCollum. The hotly contested game came down to the buzzer as the white team leading 31-30 intercepted an inbound play intended for Lillard to hold on for the win. 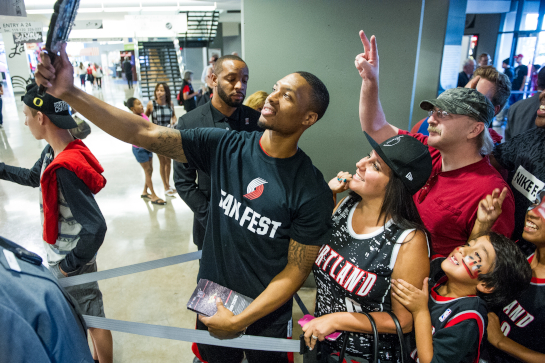 Portland Trailblazer guard Damian Lillard takes a selfie with fans as they enter the Moda Center for Fan Fest 2015. 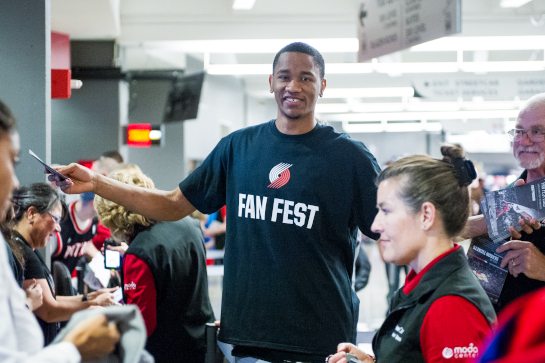 Portland Trailblazer guard Luis Montero greets fans as they enter the Moda Center for Fan Fest 2015. 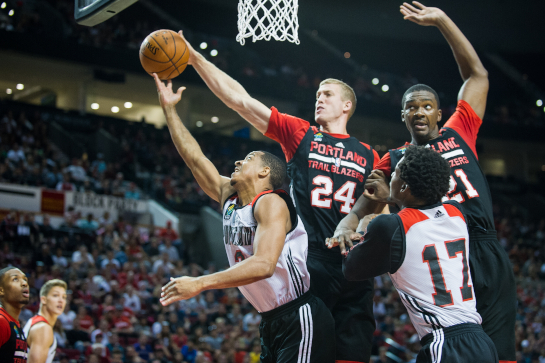 Trailblazer forward Mason Plumlee (24) blocks the layup attempt by CJ McCollum (3) during the first quarter of the Blazer Fan Fest scrimmage. 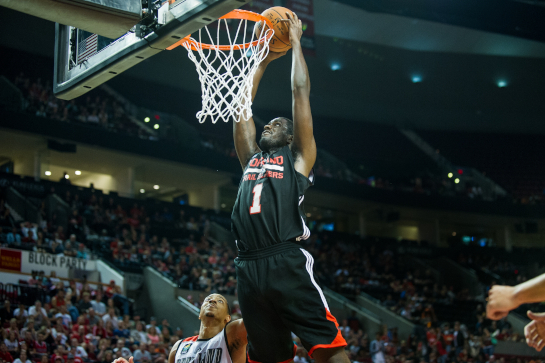 Also pictured are Noah Vonleh (21) and Ed Davis (17). 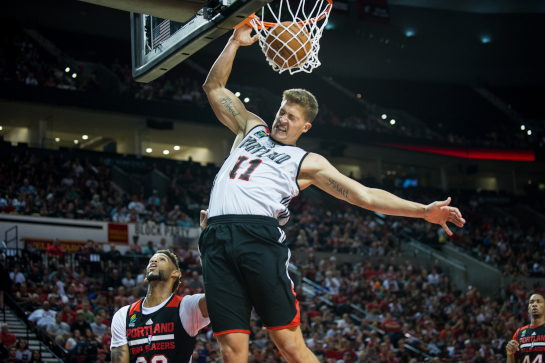 Trailblazer forward Meyers Leonard (11) dunks the ball on a second quarter break during the Blazer Fan Fest scrimmage. 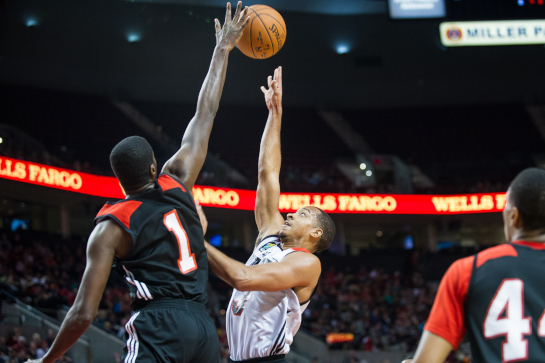 Trailblazer guard CJ McCullum (right) shoots over the reach of forward Omari Johnson (1) during the second quarter of the Blazer Fan Fest scrimmage. 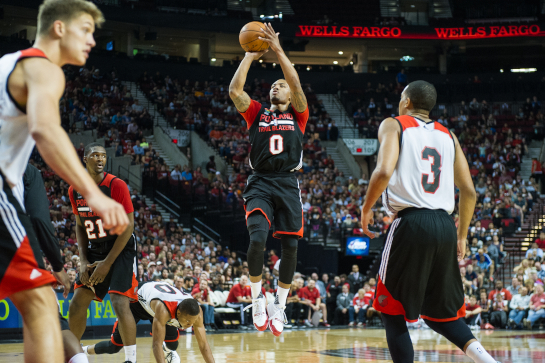 Trailblazer guard Damian Lillard (0) shoots a jumper in the lane during the third quarter of the Fan Fest scrimmage. Trailblazer forward Omari Johnson (1) dunks the ball on the tail end of a fourth quarter fast break during the Fan Fest scrimmage. 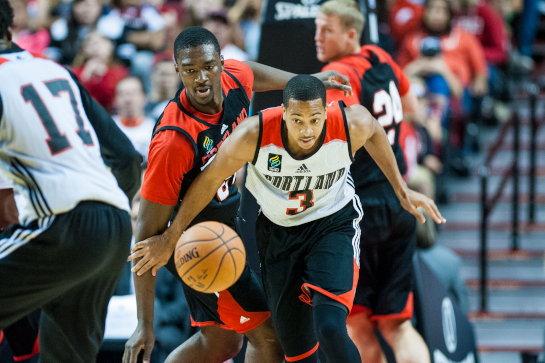 Trailblazer guard CJ McCullum (3) sets of on a fast break past forward Noah Vonleh (left) during the first quarter of the Fan Fest scrimmage. 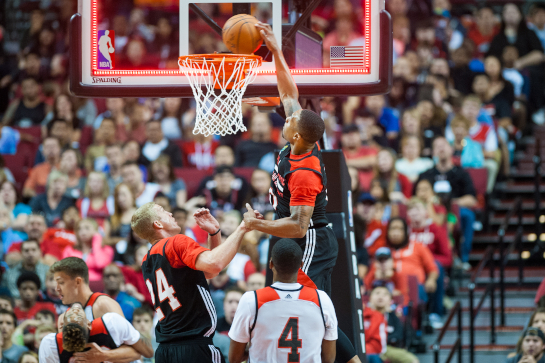 Trailblazer guard Damian Lillard dunks the ball at the buzzer ending the first quarter. The basket counted as referees did not have the benefit of instant replay during the Fan Fest scrimmage. 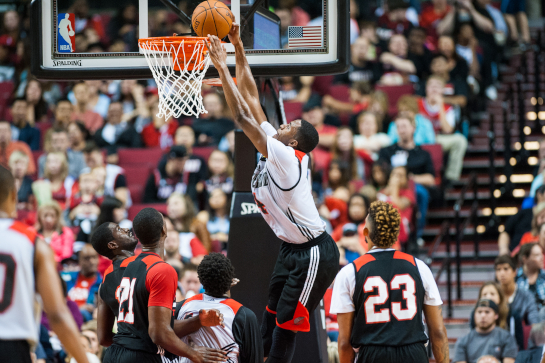 Trailblazer forward Maurice Harkless dunks the ball during the third quarter of the Fan Fest scrimmage. 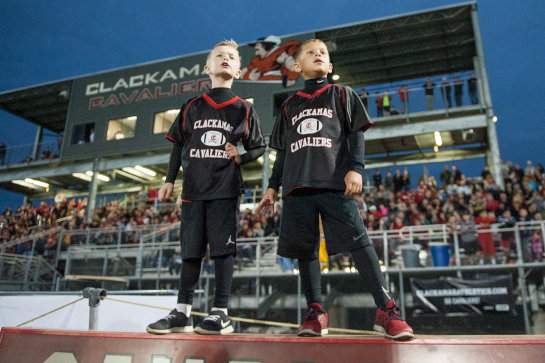 Blazer dancers perform during a break in the action of the Fan Fest scrimmage. 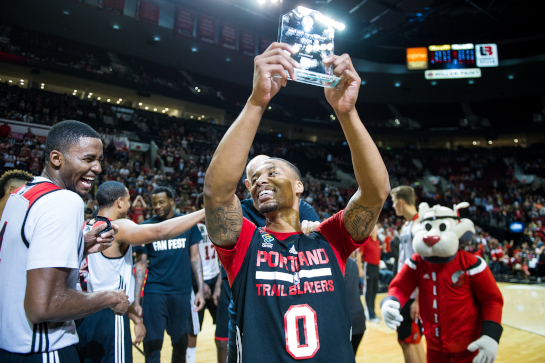 Damian Lillard (0) shares a humorous moment with Maurice Harkless (left) as he holds up the trophy he was presented as the MVP of the Fan Fest scrimmage. 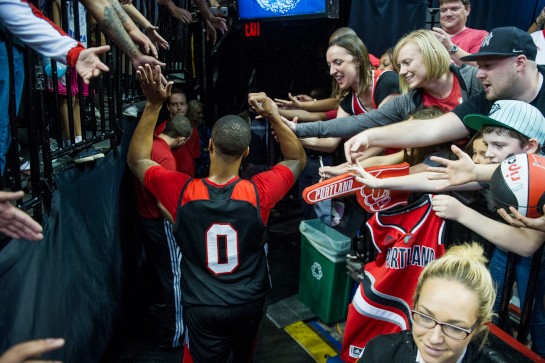 Trailblazer guard Damian Lillard greats fans as he exists the Moda Center court following Fan Fest scrimmage. 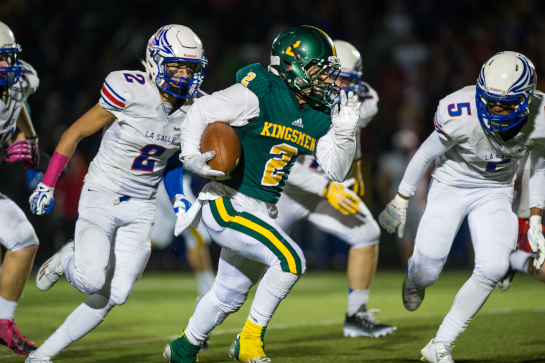 The Liberty Falcons took advantage of costly turnovers by Rex Putnam to cruise to a 41-6 victory at the Rex Putnam' Foelker Field on homecoming night for the Kingsmen. 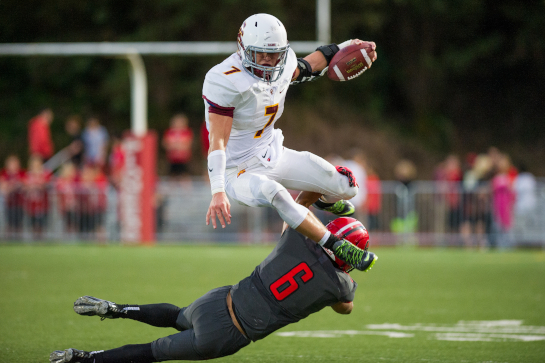 With the score tied 6-6 at the half, Putnam felt in good position to challenge the No. 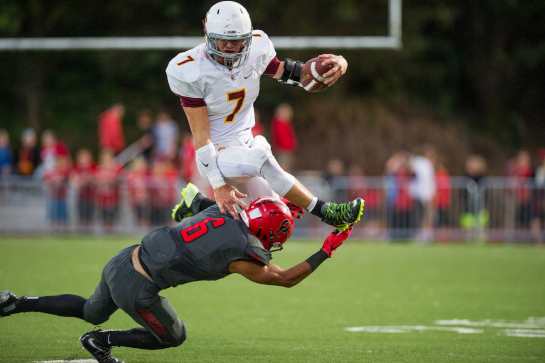 2 OSAA 5A Falcons in the second half. 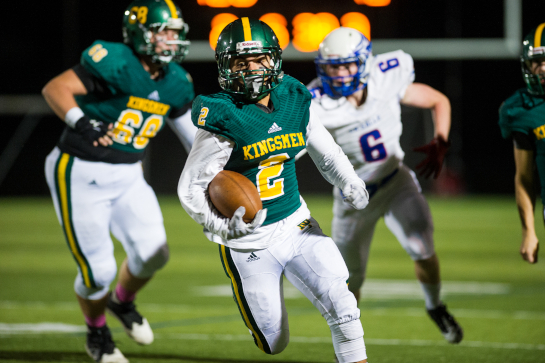 Liberty running back Devin Kaneshiro quickly dash the Kingmen's hopes as he ran for a 68 yard touchdown 2:30 into the third quarter. In just a little over a minute later defensive lineman Bailey Haines recovered a Putnam fumble and road the expressway to the endzone for a 71 yard touchdown. 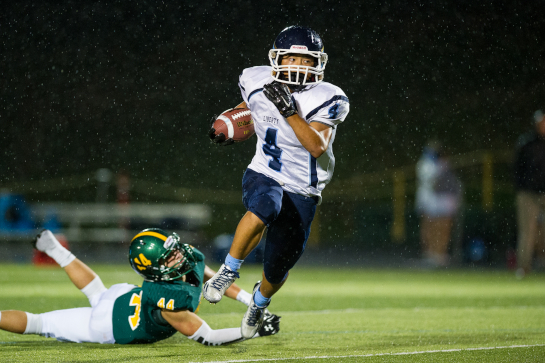 Liberty added touchdowns by Charles Clark, Yousef Koborsi and Minoo Ha to round out the scoring. Rex Putnam running back Beau Winters (8) runs for a short gain in the first quarter before being brought down by Liberty linebacker Devin Thompson (left). 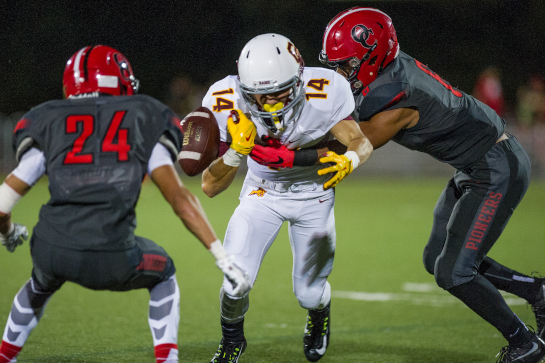 Liberty running back Devin Kaneshiro (4) cuts into a gap in the Putnam defensive line to get into the endzone for a touchdown with 6:51 left in the first quarter. 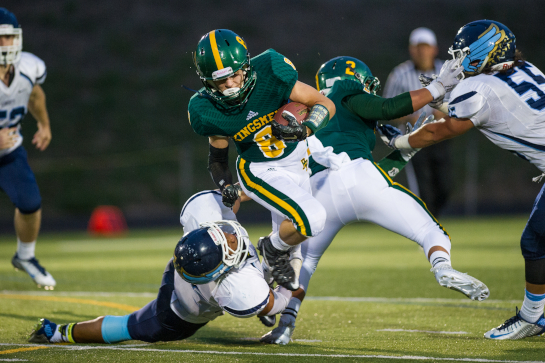 Rex Putnam running back Jesse Countryman (2) runs for a first down during a first quarter drive. 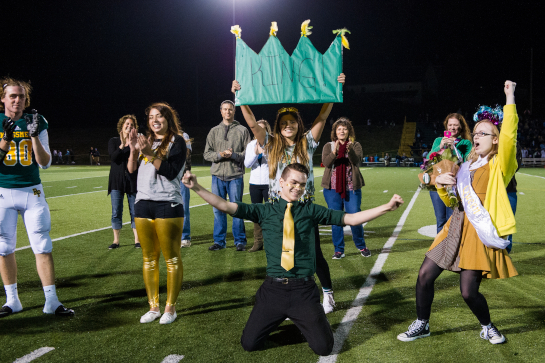 Rex Putnam Senior Keegan Brooks (kneeling) celebrates as he is proclaimed Homecoming King for 22015. 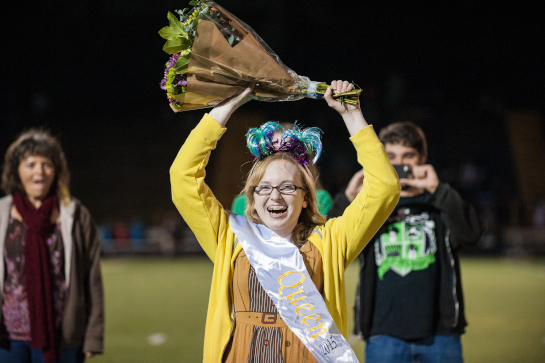 Rex Putnam Senior Veronica Kidby celebrates being selected as Homecoming Queen 2015. 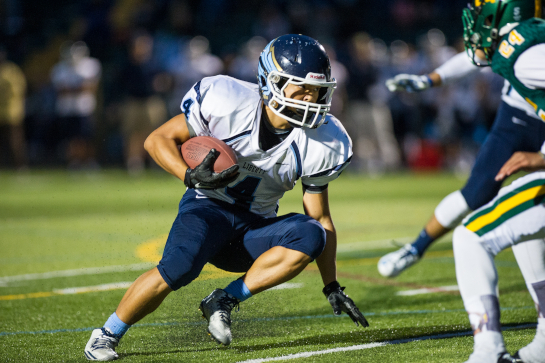 Liberty running back Minoo Ha (4) slips past Rex Putnam linebacker Ammon Rial (44) in the backfield as he goes on for a 13 yard gain during the third quarter. 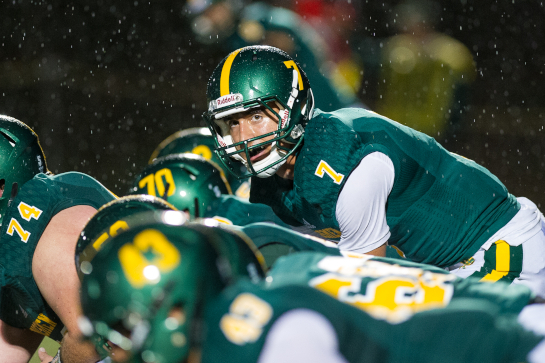 Rex Putnam quarterback Jake Hamilton (7) readies for the snap during a third quarter drive. 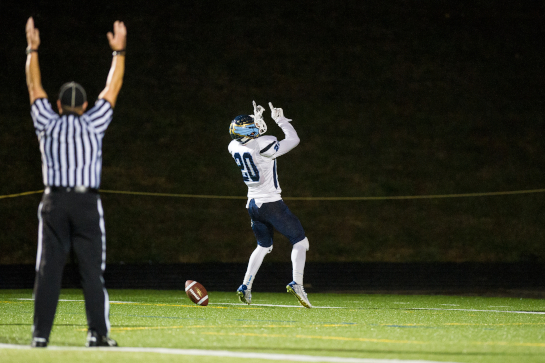 Liberty running back Charles Clark (20) celebrates his 36 yard touchdown run with 1:12 to go in the third quarter. 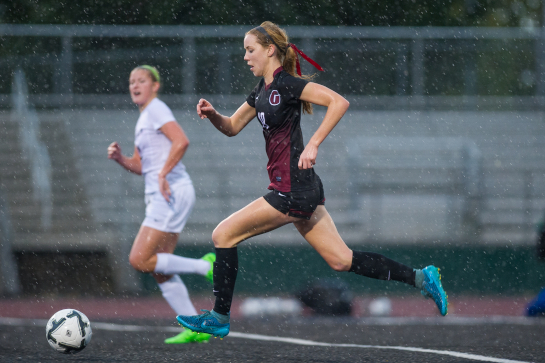 Glencoe and Hillsboro High Schools played to a 1-1 draw during a pre-season contest at the Hare Field Stadium in Hillsboro, Oregon. 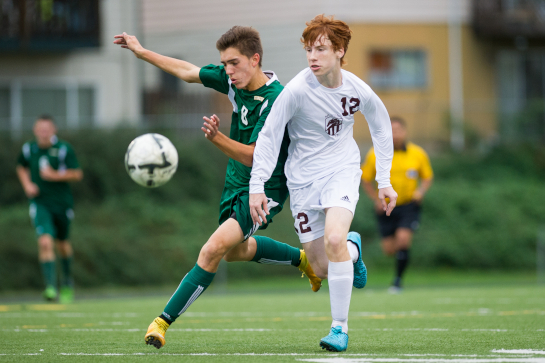 With each team having opportunities to notch a goal in the first half, the match remained scoreless until Glencoe midfielder Noah Spellman headed the ball into the net off a far post cross from Javier Cazares with 27:51 remaining in the second half. 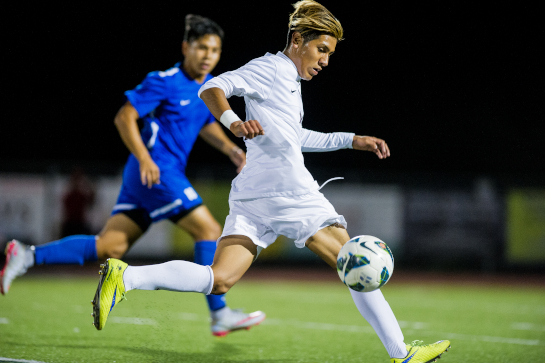 Hillsboro evened up the score with a goal from Miguel Tena-Palomares. 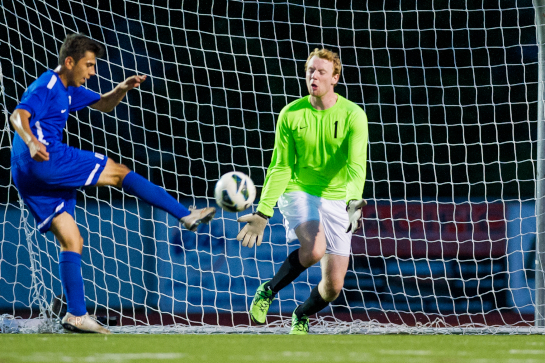 Glencoe goalkeeper Cameron Svenson (right) comes off his line to save a volley by Hillsboro defender Ramon Mercado Quezada (left) in the first half of the pre-seaon match between the rival Hillsboro schools. 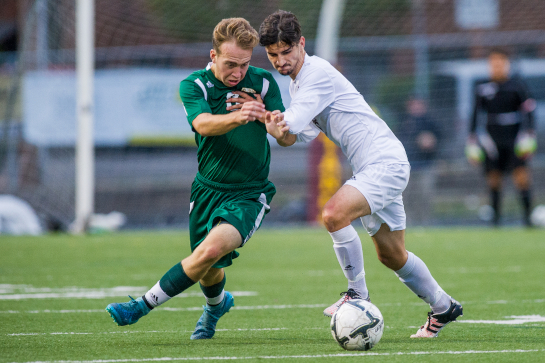 Defender Ethan Vanderzanden (right) of Glencoe beats Hillsboro forward Roberto Mora (left) to the ball breaking up a first half attack during the pre-season derby at Hare Field in Hillsboro. 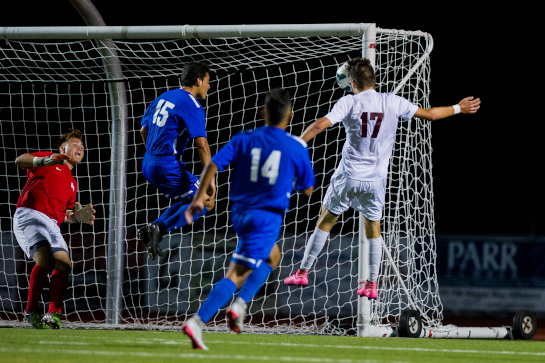 Glencoe midfielder Noah Spellman (17) heads the ball into the net off the far post cross past Hillsboro defenders Luis Guevara (15), Juan Pedro Moreno Olmeda (14) and goalkeeper Jose Rodriquez (in red). 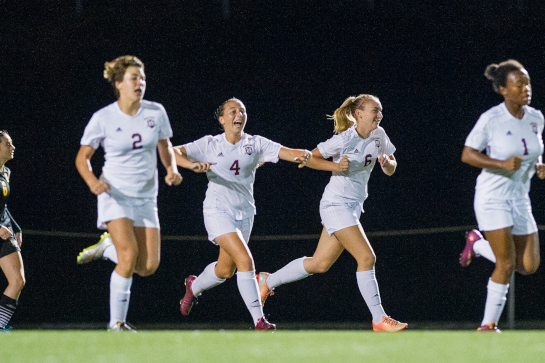 Spellman's goal gave the Tide a 1-0 lead with 27:51 left in the second half of the match. 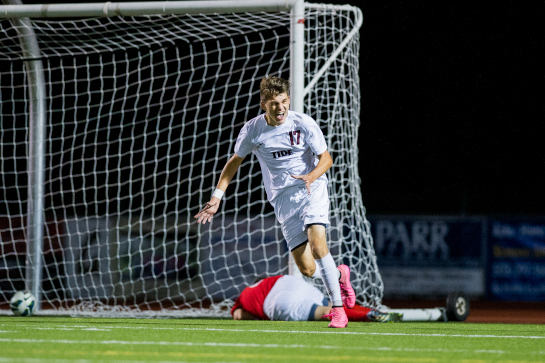 Glencoe midfielder Noah Spellman (17) celebrates his goal off a far post header as Hillsboro goalkeeper Jose Rodriquez (in red) lays on the ground in frustration as Spellman's goal gave the Tide a 1-0 lead with 27:51 left in the second half of the match. 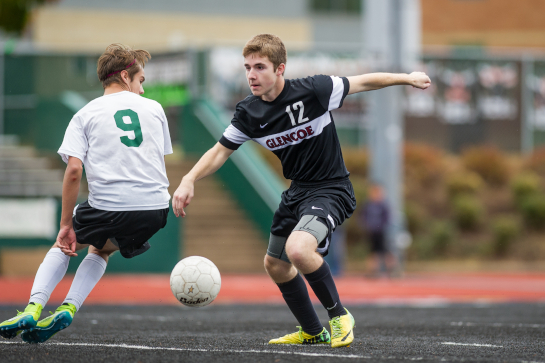 Glencoe forward Noah Spellman advances the ball through midfield during the second half of the Crimson Tide's match against local rival Hillsboro High. 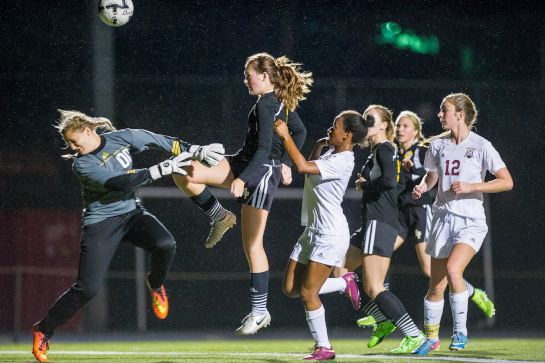 Spelman scored Glencoe's lone goal with a second half goal off a far post header. 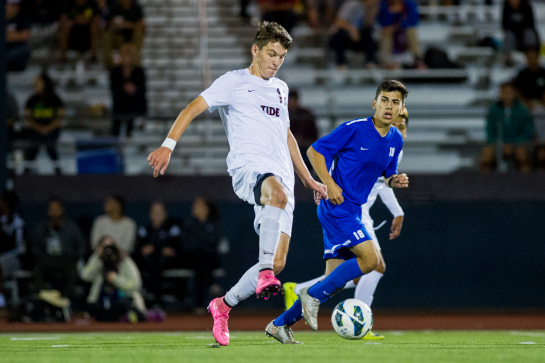 Glencoe forward Jonathan Medel Tellez (right) connects with a through ball from midfield to on a break while defended by Hillsboro defender Kevin Estrella (left) during the second half of the pre-season derby match at Hare Field in Hillsboro. 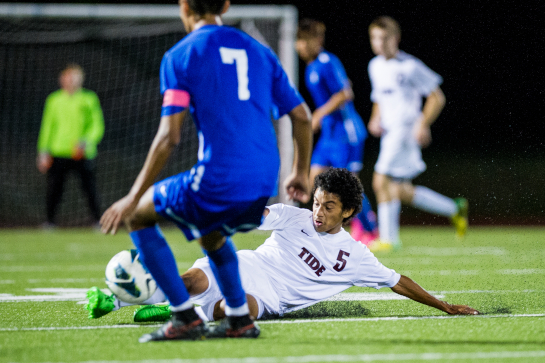 Glencoe midfielder Eddie Sauceda (5) slides to win a tackle against Hillsboro Sergio Aquilar (foreground) during the second half of the Tide's derby match against Hillsboro High at Hare Field in Hillsboro.